What is curious about a monad is that it has no physical or material entrance or exit; the only way to gain access to one is by using one's intrinsic, personal intuition. Italian artist Paolo Bottarelli refers to the units of his latest project as “monads” or “mind rooms”―a term borrowed from German mathematician Gottfried Leibniz to illustrate that outlooks are built from basic units of the rational and irrational. Exhibiting at the 6th Momentum Biennial, Bottarelli provides an oversized, three-dimensional variation of a chess square-as-cube emphasizing the mind's inclination for dual perception (and even deception). These monads are likened to an indispensable force or energy―the white cube represents positivity, and the black cube asserts itself as its negative counterpart. The project continues, and Bottarelli will document sixty-four cubic scenarios―thirty-four white cubes, thirty-four black cubes―in three different formats: video, painting and photography. The installation of each cube is not arbitrary; the artist consciously depends upon mathematics and geometry to determine each cube's spatial arrangement, though how and to what degree is not entirely explicit. The ChessCube Project is reminiscent of the intimate games one plays while in a solitary milieu, left to one's devices for entertainment, solace or escape. Solitary games have the capacity to be more involved than those which engage others―the stakes are higher, the level of discomfort more intense, answers to questions less absolute, and any ambition to win is internalized because it is linked to an isolated player instead of a team. Yet, this work is based upon and inspired by a game that has two players in direct opposition―a graceful harmony in accordance to the game's prescriptions. The ChessCube Project becomes a game where one places the left and right cerebral hemispheres of their brain against one another; the logical is placed against the illogical, guiding the player towards that which may or may not be synonymous with victory or even resolution. The white cube as an exhausted museum and gallery phenomenon is no secret. But what becomes possible when this space is observed repeatedly from multiple angles simultaneously via painting, film and photography? Is one angle more significant than another; are any of these perspectives dependent upon others, or can they thrive independently without the presence of their visual counterparts? Like chess, one player needs the other. Bottarelli's work is both intensified and obscured by producing three contrasting positions to each chess cube scenario. This work intends to persuade one of their continually evolving position―this cannot be realized without the ability to place one's self outside of one's self. Another goal: to expose both the importance and limitations of premeditated strategy and intellect. Knowledge is built upon agreements or proofs, but what occurs when new evidence surfaces and from an unpredictable direction? "...based on ideas of dichotomy, autopoietic synthesis and fluctuation. 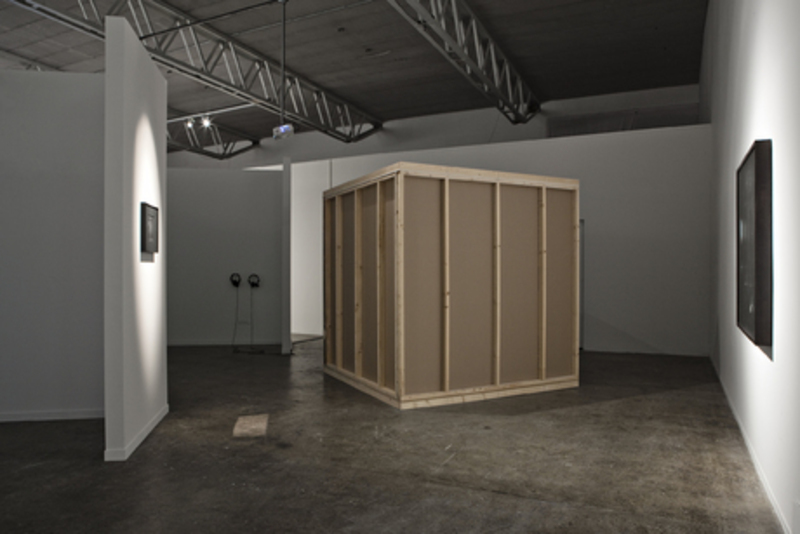 Through a process of self-cancellation and self-regeneration, in semantic dialogue between the various morphological and spatial forms, the sound event is focused on diegetic reasoning that emphasizes the space, rendering it a kind of place/non-place." The black and white cubes have contrasting sound frequencies: black possesses a lulling, nocturnal frequency (in D flat) whereas white is more so a kinetic, binaural beat (in the key of E). This dichotomy accentuates cycles of action versus inaction. Without periods of nothingness, there is no time to prepare to make a move, to construct and deconstruct one's ego and external circumstances, to understand how influence affects decision-making. Over time, one may become less innocent, possibly even jaded. Yet, in the midst of a pause between punctuated peaks, one may be more able to identify what is either reflected and refracted, accepted or rejected. This work does not wish to encapsulate the artist or observer―Bottarelli comments: “But how can you look at something and set your own ego aside? Whose eyes are doing the looking?” Bottarelli's prismatic exercise of repositioning one's self allows for infinite renegotiation. The ChessCube Project as it is encountered at Momentum Kunsthall is situated inside and among a synthetic labyrinth of open-aired cubicles built to resemble artist studios; upon arriving in Bottarelli's designated “studio” area, moxie and sly duplicity prevail.